This book col­lects 24 Mar­i­an devo­tees’ accounts of their expe­ri­ences in Mar­i­an pil­grim sites. The sites are found in Bosnia-Herze­gov­ina, Eritrea, Ethiopia, France, India, Mex­i­co, Poland, Por­tu­gal, Spain, Turkey, the Unit­ed States, and there are eight Pil­grim sites in the Philip­pines. 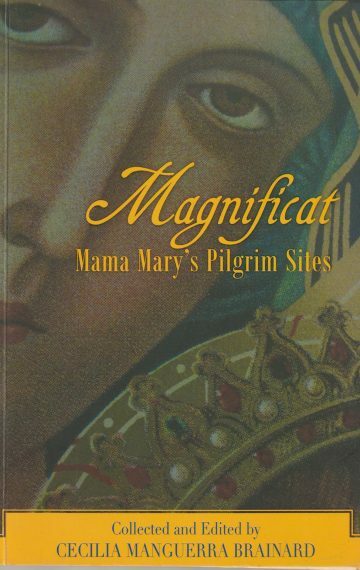 The book includes short write-ups of oth­er inter­na­tion­al pil­grim sites and some Catholic Prayers. The book has an Impri­matur issued by Arch­bish­op Tagle of Mani­la. Con­trib­u­tors are: Lucy Adao McGin­ley, Cecil­ia Manguer­ra Brainard, Angeli­ta Calu­ag Cruz, Maria Cio­con, Celeste, Ma. Ceres P. Doyo, Mil­li­cent Dyp­i­ang­co, Ma. Mila­gros T. Dum­dum, Pene­lope V. Flo­res, Almi­ra Astudil­lo Gilles, Ma. Tere­si­ta Her­rera-Tan, Fe Aida Lac­samana-Reyes, Jaime C. Laya, Guia Lim, Lin­da Nietes-Lit­tle, Ma. Tere­sa Z. Lopez, Aimee Gaboya Orte­ga Lucero, Lyn­ley Salome R. Ocam­po, Ma. Cristi­na Padil­la-Sendin, Mar­sha C. Paras, Rev. Dr. Sebas­t­ian Peri­an­nan, Bri­an Ascalon Roley, Julia H. Wol­s­ki, and Lin­da Yamamo­to.